In social life, everyone in the world needs a friend to share everything what their want. Friend has wonderful meaning. Each people have different perception to the meaning of friend. It depends on our self to appreciate it. 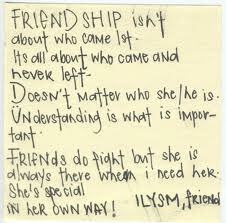 The relation between someone to someone else it calls friendship. It can happen to everyone, boy-girl, boy-boy, girl-girl, and young person to older person it can be good friend. But, Is it possible become best friend between male and female without romance? I think it will be hard. Why? Because if the relation between male and female had became “best friend”, it really hard to deny that they don’t have the ‘feeling’ to each other. I talked like this because I ever had best friend, he was so kind to me, but finally I knew that he wanted to be my best friend because he had feeling to me. Then, our friendship destroyed because of love and now we look like don’t know each other. It is so funny and grisly. In other case, it is possible become good friend between male and female without romance. We can just make a friend and not using your ‘heart’ when makes good friends to all people. We can play, laugh, eat, study, etc. together without feel guilty to other people because we are friends. as long as we feel pleasurable, it's fine. I think that’s good idea. But if the relationship between male and female want to marry, this is another case too. So, if you don’t want to loose your best friend, don’t let your ‘heart’ follow your action in friendship.